The New York Mercantile Exchange (NYMEX) is located at One North End Avenue in Manhattan, New York City, USA. It also has branch offices in London, Tokyo and Dubai, as well as in the U.S. cities of Washington D. C., San Francisco, Atlanta and Boston. Since 1994, COMEX is a division of NYMEX. NYMEX closed their trading pit on December 30, 2016. The open outcry method is no longer used on NYMEX. Instead, trading takes place on an electronic platform called Globex. The shift over to electronic trading was gradual. In the early 2000s, NYMEX was still relying on the open outcry method only and feeling the intense competition from more modern exchanges, including Jeff Sprecher’s Intercontinental Exchange (ICE). Something had to be done, and in 2006, NYMEX started offering their clients the option of using the electronic trading system Globex as an alternative to trading in the pit. Most clients – including many big commodity companies, banks and hedge funds – prefered Globex to open outcry and stopped using the pit. It would take ten years however, before the pit was closed for good. Comex, a division of NYMEX, is especially famous for its highly liquid market for metal futures contracts. It is a major global hub for trading in gold, silver, copper and aluminimum. Many companies in the metal industry use COMEX to hedge themselves against metal price fluctuations. The actual physical gold bullions used when traders on COMEX make and take delivery of gold are stored in COMEX approved warehouses. This is to prevent fraud and ensure that all gold bullions adhere to the COMEX (CME Group) standard. The buyer of gold shouldn’t have to carry out costly gold appriasals since this would increase transaction costs and decrease the efficiency of trading in gold on COMEX. The COMEX warehouses are also used for off-exchange trading between miners, refiners and investors. The New York Mercantile Exchange can trace its roots back to 1872, when group of diary merchants on Manhattan formed The Butter and Cheese Exchange of New York. When eggs were added to the exchange, the name changed accordingly – it was now The Butter, Cheese and Egg Exchange. Also adding poultry, dried fruit and canned goods to the name wasn’t exactly practical however, so in 1882 the exchange became The New York Mercantile Exchange. COMEX (Commodity Exchange) was formed in 1933 when four separate commodity exchanges was merged into one. These four exchange was The National Raw Silk Exchange, The National Metal Exchange, The New York Hide Exchange and The Rubber Exchange of New York. In August 1994, NYMEX and COMEX merged under the NYMEX name. Since the1970s, NYMEX and COMEX hade been located on the same floor in 4 World Trade Center in New York. NYMEX became a public company listed on the New York Stock Exchange in 2006. Parts of NYMEX was acquired by private investors, including the Chicago Mercantile Exchange (CME) who bought the physical facilities used by NYMEX. 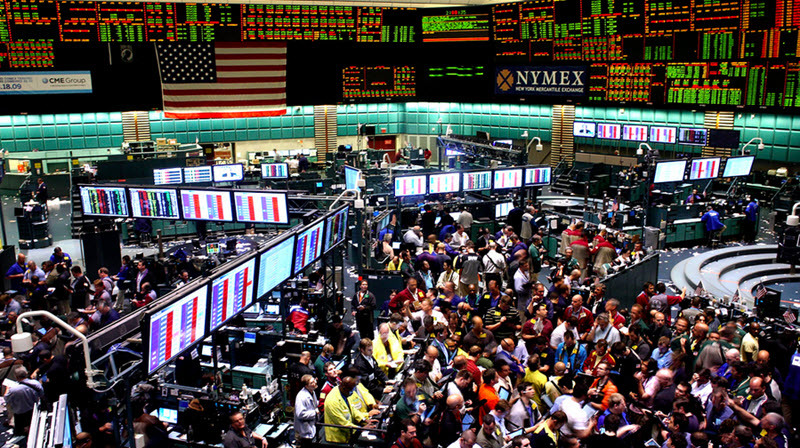 In 2008, the CME Group purchased the whole NYMEX Holdings Inc for 11.2 billion USD in cash and stock.